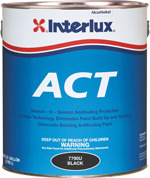 ACT uses Ablative Technology to provide excellent season to season antifouling protection for power and sail boats. Ablative Technology enables the paint to erode away with use and eliminates the build up and the heavy sanding. ACT is the trusted and reliable ablative antifouling used by boaters and boatyards for full season or season to season protection in salt, brackish and fresh water.